I hope you are doing awesome! I have taken a few weeks off from solo gigs becuase things have been a little crazy in the Hedges household. What's so crazy?? Well, little infant Mason was sick and required two visits to the Dr. AND two visits to the ER, and little toddler Liam's potty-training has been all over the place - Literally - just last weekend he let loose two tinkles in the potty and unleashed one serious poo right on the living room carpet! Mason is all better now and Liam, well...we just cheer him on! Enough of potty talk though, I want to tell you about some really really exciting news regardng my band, The Outcome! We are very excited to announce we will be releasing our latest single, "Home", at Ace Of Spades on May 17th opening up for Zoso - a Tribute to Led Zeppelin!! This is by far going to be the biggest stage we have played to date, and we would absolutely LOVE if you could join us! If you have only seen me perform solo and have wanted to catch a show with the band, this is THE show to attend! We have teamed up with multiple Grammy Award-Winning Engineers and other amazing artists to help us with our song and couldn't be more proud of the outcome! (....see what I did there?) If you are interested, please purchase your tickets HERE! We've been working so hard and each and every ticket we sell helps us out a great deal! In the months to come, we will be releasing some awesome videos and promo materials, that I will share wth you! Also, you can catch us at during Happy Hour at The Torch Club (www.torchclub.net) this Friday (February 22nd) from 5:30-7:30 PM - FREE!! Thank you once again for your amazing support and for inspiring me to keep pursuing my passion. P.s. Baseball season...I'm ready for you. Let's go Phillies!! P.p.s. I'll have some more solo shows lined up very soon! Stay tuned! P.p.p.s. Yes....my son pooped on the carpet...his diaper was only off for like 25 seconds!! P.p.p.p.s. I've released 5 solo albums (2 by the Quinn Hedges Band), and an EP with The Outcome...if you are interested in getting a package containing all of them, I'm selling them as a bundle for $45 - (That's 5 CDs and a DVD/CD combo) until April. If interested, just reply to this email and I'll hook you up!! I hope you are doing awesome!! As you may or may not already know, I have slowed down my gig schedule because there will soon be an addition to the Hedges family! Baby Hedges is due next month and Davita is doing amazing! As of right now, I plan on taking the month of August off to prepare for the new baby, so if you want to catch a show soon, please come on out to see myself and/or The Outcome this month!! Thank you once again for your amazing support! I hope to see you at a show in the near future, and please remember that you are awesome! P.s. The featured picture above is of the newest addition to my guitar collection! It's a 1970 Walnut Gibson ES-335 TD. I've wanted this guitar for a long, long time and when the opportunity presented myself, I had to swoop in and grab it! Come out to see The Outcome play at the Torch Club this month and you'll hear how beautiful she sounds! P.p.s. The Hedges Family had a great (and very busy) trip to the east coast this past month. We visited Boston, New York, Dewey Beach, DE, and Philadelphia in the span of 2 weeks. P.p.p.s. For those of you waiting for the camel picture as mentioned in last month's newsletter, it turns out that Liam was too young to go on the camel ride at the Bronx Zoo...so I unfortunately do not have a picture to share. Sorry to disappoint! we were able to visit the Statue of Liberty though! P.p.p.p.s. Liam's favorite song right now is "Wow" by Beck. Every time the song comes on he stops everything he's doing and whispers, "Wowwww" really loud. I hope you are doing awesome! I've got a couple of shows this month to tell you about; however, my schedule is a little light because the Hedges family is about to take a much needed vacation! House of Oliver (6/1 & 7/7), Casque Wines (6/22), Wildwood Kitchen and Bar (6/23), High Steaks Restaurant (6/28), Pink Martini (7/28), and The Out of Bounds Brewery in Folsom (7/22). THE OUTCOME has some exciting news and upcoming shows as well! We have just finished tracking everything for a new single that we are really excited to release towards the end of the year. We will keep you posted!! Also, we are performing at the XOXO Music Festival on (7/15). This is a 3-day music festival with an extremely impressive lineup of well-known acts. We're really excited for the opportunity!! If you are into music festivals, please check out the link to purchase tickets HERE (https://xoxomusicfestival.com/home/) ! only help professional musicians hone their craft, but also give the opportunity to young musicians starting out to express their passion, but develop dreams and love for creating original music. Good Luck Preston! I hope the Den is around for a long long time! Thank you once again for your amazing support! You are awesome! P.s. We just watched "Evil Genius" on Netflix....holy moley. P.p.p.s. I have been requested to take a camel ride while on our vacation. Please be on the lookout for an unflattering picture posted on social media of me trying to balance myself and my toddler son on a, most likely not-so-great smelling, hump. P.p.p.p.s. No, we are not traveling to the middle east...apparently there are camel rides at a zoo in New York. On Friday, May 4th, I'll be performing at Porchlight Brewing Company from 6:30-9:30 PM. This is a special fundraiser to benefit the family of Monty, who is currently battling Burkitt lymphoma, a form of non-Hodgkin's lymphoma in which cancer starts in immune cells called B-cells. 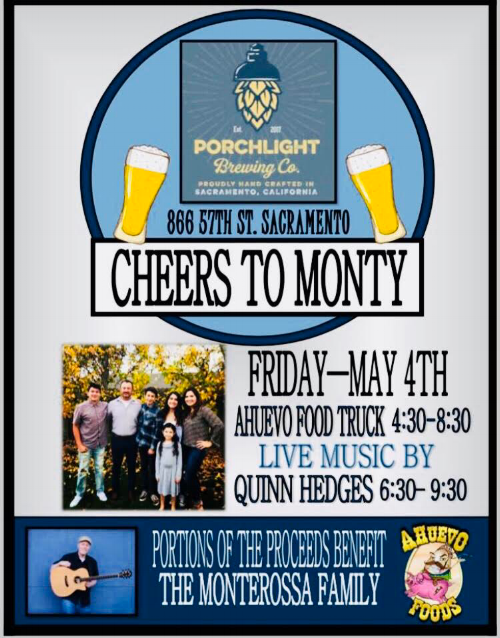 Porchlight Brewing Company has some absolutely amazing craft beers, and the Ahuevo Food Truck will be on hand to provide the deliciousness. If you are wanting to help out a family in need, this is a great event to attend. On Friday, 5/11, THE OUTCOME will be performing at Raley Field for "Orange Friday"! We will be performing from 6-7 PM. First pitch is at 7:05 PM and you can get your tickets HERE! Saturday, 5/12 - I will be performing solo at the one and only Prohibition Wine Lounge in Folsom, from 8-10 PM. FREE! Thursday, 5/17 - I'm back solo at Wildwood Kitchen & Bar located in the Pavillions in Sacramento. Amazing atmosphere, service, and dinner!! FREE! Friday, 5/18 - I'll be back for a second show this month at Porchlight Brewing Company! 6:30-9:30 PM. FREE! Saturday, 5/19 - I'll be strumming my guitar and singing out on the beautiful patio of Roseville's premiere wine bar and bistro, House of Oliver. 7-11 PM. FREE! Saturday, 5/26 - I'll be performing solo at UnWined in Folsom from 6:30-9:30 PM. I've been performing here regularly for nearly a decade! Please make a reservation as seating is limited. ALSO!!! The Outcome will be performing at the XOXO Music Festival in the Bay Area in July!! We'll be performing alongside of some big names...tickets are available now HERE !! Check it out!! (We're listed on the 2nd to last line if your eyes are going bad). P.s. In the beginning of June, the Hedges family will taking a trip to Boston, New York, Philadelphia, and Delaware next month...Liam will be 22 months old and we will be flying non-stop from San Francisco to Boston. Please pray for me. P.p.s. Davita and I just finished Season 1 of Mindhunter on Netflix...I highly recommend it! What's up?! How the heck are ya? I have some really neat solo performances this month at the following amazing venues: Prohibition Wine Lounge, House of Oliver, and UnWined! All these shows are free!! On April 14th, The Outcome will be performing a set at Armadillo Music in Davis from 6:30-7:30 PM. This is a music series entitled "About Art" done through the amazing KDRT radio station. Cruise on by and shop for some used vinyl while hearing The Outcome rock out! On May 11th, we are really excited to be performing at a Sacramento River Cats game for Orange Friday! We'll be performing for about an hour before the game starts. Get your tickets now and let's watch some baseball together!! Thank you once again for your ongoing support of my journey with music! You are awesome! P.p.s. Yesterday my son, Liam, turned 20 months old the same time that my baby-on-the-way turned 20 weeks old in the womb. Speaking of Liam, he now says "Daddy" and "Guitar" about 100 times per day!! P.p.p.s. Davita and I started watching "Mindhunter" on Netflix. It started out on the slow side, but it has really picked up steam!! Check it out if you are looking for a new show to watch. I hope you are doing awesome! This is the last month of my break from playing solo shows; I'll be back next month at Prohibition Wine Lounge, House of Oliver, UnWined, and more amazing venues! The band I am a part of, The Outcome, has some awesome shows this month that we are pumped to be a part of. First off, on Wednesday, March 14th, we will be performing along side of a couple of amazing Sacramento bands (Mondo Deco and Mikey LP & the Krooks) for 98 Rock's "Local Licks" concert series at the Powerhouse Pub in Folsom. Music starts at 8 PM! The Outcome will also be playing Happy Hour at the World Famous Torch Club on Friday, March 23rd, from 5:30-7:30 PM! We've been working really hard lately and can't wait to share our tunes with you! Here's a link to The Outcome's EP called "I'll Take It" for sale now!! As always, thank you again for your amazing support! I can't wait to see you in the very near future! P.s. If you were wondering what the good news was at the end of my last newsletter, here you go: Davita and I are expecting another little one!! Yup...the due date for the next baby Hedges is 8/17/18. Liam is absolutely thrilled to become a big brother!! Well....he doesn't really talk much yet, but I can tell in his eyes that he's stoked. P.p.s. Liam's current favorite song is the Van Halen classic, "Drop Dead Legs"! We rock out to this song on a daily basis. P.p.p.s. I'm excited to see Stone Temple Pilots next week!! It'll be weird to hear them without Scott Weiland, but I'm sure they will rock. P.p.p.p.s. There are many things I am grateful for in the world and music is by far one of the most important; however, I'd like to share with you how grateful I am for sports. I know that may sound weird, but let me explain. Being a Philadelphia Eagles fan this season was an amazing thing to experience for more than just watching football on Sundays. The fact that the Eagles played so well inspired me to call my 95 year old Grandfather every Monday morning on my way to work. He would pick up the phone and say, "Well Hello Quinn...How about those Iggles??" We would talk briefly about how awesome Carson Wentz played and then basically catch up on life and so forth. When the Eagles won the game that led them to the Super Bowl we spoke right after the game and shared our enthusiasm and excitement! As most of you know, the Eagles ended up winning the Super Bowl; however, I never did have the chance to talk with my Grandfather about the game because he became ill and very quickly thereafter, passed away. Although I was upset I was never able to share thoughts of the Eagles very first Super Bowl victory with him, I can't express how grateful I am for how well the Eagles played not so much because they won the big game, but because it allowed me to re-connect with my Grandfather on a regular basis prior to his passing. If this season had gone in a different direction, there's a very good possibility I'd be kicking myself right now for not keeping in touch. Sports are more than just athletic people making tons of money, they are a vessel for cultivating and enhancing relationships. For this, I am extremely grateful. Rest in Peace Grandad - Fly Eagles Fly! I hope you are doing awesome! Since I am so tardy with this email, this will serve as my January and February music newsletter. + My good friend, fellow musician, and music engineer extraordinaire, Zack Proteau's parents lost their home and all of their belongings in the recent fires that plagued Northern California. Donations will be accepted at the door and 100% of the proceeds will go directly to the Proteau Family. This show features many amazing Sacramento artists that have decided to donate their time for a wonderful cause. If you can make it to donate, or check out some amazing music, it will be well appreciated. I'll be performing with The Outcome and with The Authority! P.p.s. How about those Philadelphia Eagles?!? Super Bowl Bound! Fingers crossed that they can win their 1st ever Super Bowl ring. Fly Eagles Fly!!!! P.p.p.p.s. I have some pretty exiting news to share with you next month! On December 8th, the band I perform in will be officially releasing our "I'll Take It" EP! If you have only seen me perform solo acoustic shows at wine bars and restaurants, this is the perfect opportunity to see me let loose on electric guitar! The Outcome consists of a quartet of highly talented and driven individuals and we can't wait to share what we've been working on so hard with you. Also performing that night is Cover Me Badd (the best cover/dance band in the region and the band my sister Hilary performs in). This will surely be a great night of amazing tunes and good vibes all around. $10 cover. The Outcome will also be performing at The Torch Club on 12/22 (5:30 PM), and at Bella Bru Cafe on 12/29 (8:00 PM). P.s. I just wanted to let you know that I will be taking three months off from performing solo shows beginning 2018. I have been performing nonstop for the last 12 years (plus keeping my day job somehow) and have not really taken much of a break. Now that I have a family, I feel it's time to take a little break to focus in that field and also try writing some new material. I will, however, still be performing in The Outcome. Don't worry though, I'll be back at your favorite venues in April! P.p.s. I recently performed a show for hospitalized children and it was quite an eye-opener. It is so easy to take the little things, like health, for granted. I can't tell you how wonderfully blessed I am and how I need to do a better job realizing this fact...even as I change my son's poopy diapers...while gagging. P.p.p.s. How about those Philadelphia Eagles?!? As any fan of Philadelphia sports can relate, I'm cautiously optimistic about how this season is turning out. However, Carson Wentz is the MAN!! P.p.p.p.s. I am slowly learning every line of my son Liam's favorite movies...Trolls, Moana, and Sing. Seriously, quiz me. How awesome would it be if Queen Poppy ever came across the Heart of Tafiti at the Moon Theater?!? I hope you are doing great! I've got some great shows this month that I'm really excited to share with you. Generally, I start by announcing my solo shows, but this month, I've got some really great news about my band, The Outcome! We have finally booked an EP Release Show!! Mark your calendars for December 8th as we will be performing at Harlow's Night Club (https://www.harlows.com/) !! The show starts at 9:30 PM!! AND, joining us that evening are our friends, and my favorite cover band, Cover Me Badd (http://www.covermebadd.net) (also the band my sister performs with). This show is long overdue for us and if you have not seen us perform yet, this would be a great opportunity to celebrate our release with us!! On Friday 11/17, we will be back to playing at our favorite home base, The Torch Club (http://www.torchclub.net) , for Happy Hour from 5:30-7:30 PM. First off, I'll be performing for the first time at Porchlight Brewing Company (https://porchlightbrewingcompany.com/) on Friday 11/3 and again on 11/10! I'm excited for that first sip of Porchlight's delicious, cold, and refreshing craft brew after a long work week! Both events go from 6:30-9:30 PM. Free. Also...there will be food trucks! On 11/30, I was approached to perform a Sophie's Place Showcase for pediatric patients ages 1-19 of Sutter's Children's Center. I'm really excited to bring some music into the lives of those who need it so desperately. What songs I'm going to perform on the other hand?....I have no clue! on 12/2, I'm back at another one of my favorite new venues, Prohibition Wine Lounge (http://www.prohibitionwinelounge.com/) , from 8 - 11 PM. P.s. I'd like to take a quick moment to reflect on all of those who lost their homes, jobs, and even lives in the recent Northern California fires. A very close friend's parents lost their home of many many years and it has been devastating. I'm currently working on setting up a benefit show for their family and will keep you posted! P.p.p.s. The Hedges family had an amazing time in Yosemite!! Also, Liam was Chucky for Halloween this year! P.p.p.p.s. Let's Go Eagles!!! As a Philadelphia fan, it's imperative that I remain cautiously optimistic about the team and not get too overly excited....but they have been fun to watch thus far! This Friday (10/6), I'm very excited to perform for the first time at Crooked Lane Brewing in Auburn, CA from 7-9 PM. What's better than delicious craft beer and tunes on a Friday night? On Thursday, 10/12, I'll be performing at the Patient Appreciation and Red Carpet event for Dr. Jon, DDS. He's been my dentist for the last couple of years, but a friend for even longer. If you are looking for a great dentist in Placer County, please check him out HERE (http://drjondds.com/) ! On Friday, 10/13, The Outcome will be traveling to Placerville, CA to perform at PJ's Roadhouse. Music begins at 8 PM. Also, the very talented OnelegChuck will be performing this evening! Should be a great show! On Friday, 10/20, I'll be back at one of my all-time favorite venues, House of Oliver! I'll be performing from 7-11 PM. On Saturday, 10/21, I'll be performing at one of the hottest new wine lounges in the area, Prohibition Wine Lounge, in Folsom, CA. Music goes from 8-11 PM. ALSO - I recently recorded a live performance of all original music at the Access Sacramento Television Studio (Local Cable Channel 17, I believe) that will be aired on 10/17 at 11:00 PM, 10/18 at 3:00 PM, and 10/19 at 7:00 AM. Unfortunately, I do not get this channel, so if you tune in, please let me know how I did! The Outcome had another successful day in the studio working on some new material! I'll keep you posted as things progress! P.s. Rest in Peace Tom Petty. He wrote many great songs...and left us way too young. P.p.s. My son, Liam, will be dressing up as "Chucky" from Child's Play this Halloween...a 14-month old in dressed in overalls, holding a plastic knife, all while carrying a loaded diaper... What's more scary than that?? P.p.p.p.s. The Hedges family is taking a trip to Yosemite for the first time this month! I'm really looking forward to checking this place out! I just hope those big rocks stay put! P.p.p.p.p.s. If you have any songs they would love to hear me cover at a show, please respond and let me know! I love learning new songs that I might not have chosen to do myself! How the heck are you? I hope all is well in your world! P.p.s. The Hedges family had a fantastic trip to the east coast last month! I was able to taste deliciously fresh beer at the Dogfish Head Brewery in Delaware, eat an amazing cannoli Mike Pastry's in Boston, and take my son to his first baseball game in Philadelphia. P.p.p.s. I was very grateful that we were able to introduce Liam to all of his living Great Grandparents. Liam turns 1 year old on August 5th!!! I can't believe how the time flies by! He was a great traveler on our trip back east and even took his first steps in front of his 102 year old Great Grandmother! It was a special moment and we were lucky enough to capture it on film. P.p.p.p.s. This month Davita and I going to our annual weekend of baseball as the Phillies come into town to face the Giants. These teams are hands down the worst two teams in baseball right now....so these should be competitive games, right?!? I hope you are having an amazing Summer so far! As you can see from my upcoming shows, I'm taking a couple of weeks off to recharge and go on vacation. I'm excited to be back at Bistro 33 in Davis on July 20th. Also, I'll be jamming out on the patio of House of Oliver in Roseville on July 21st. Both venues are favorites of mine! The Outcome is extremely pumped to be performing at the World Famous Torch Club on August 4th for Happy Hour (5:30-7:30 PM)! We have been recording and writing new tunes and can't wait to share them with you! Also, please like us on Facebook HERE! We are loading up our calendar with upcoming shows and aside from the Torch Club, we will be performing at Pistol Pete's and the Momo Lounge in August! An instrumental song I wrote was placed on a TV show!! Yup, a lap-steel/ukulele inspired tune of mine appeared on an episode of "Huang's World" on VICELAND! Check it out! (Season 2, Episode 4, titled "Hawaii"...about 25 minutes in). It was surreal hearing something I wrote on TV!! Thank you once again for your amazing support! P.s. The Hedges Family is about to embark on a journey to Philadelphia, Dewey/Rehoboth Beach, and Boston. The main purpose of the trip is to introduce Liam to his grandparents ( 2 in their mid-90's, and another that is 101 years old!). It'll be the first time traveling with Liam, please pray for us. P.p.s. The Giants may not be having a very amazing season thus far....but the Phillies are the absolute worst team in baseball...ugh. This is making for a long summer already. P.p.p.s. I'm really excited to be able to see a couple of my favorite artists this month, Robert Cray & John Mayer! P.p.p.p.s. The Roger Waters show was unbelievable. I did end up catching the norovirus the next morning (on my birthday), but it was well worth it!! I hope you are doing well! I have a bunch of awesome shows this month, so I'll get right down to the nitty-gritty. I'll be performing solo shows at House of Oliver (an amazing wine bar in Roseville) on June 2nd & 30th, Wildwood Kitchen and Bar (an fantastic restaurant in the Pavilions) on June 8th & 10th, Prohibition Wine Lounge ( a killer wine lounge in Folsom) on June 17th, Casque Wines (One of my favorite wineries in Loomis) on June 23rd, and The Acoustic Den Cafe ( a unique intimate venue featuring local artists and original music in Roseville) on June 24th ($5 admission - also performing: Chad Wagoner & Chris Twomey). 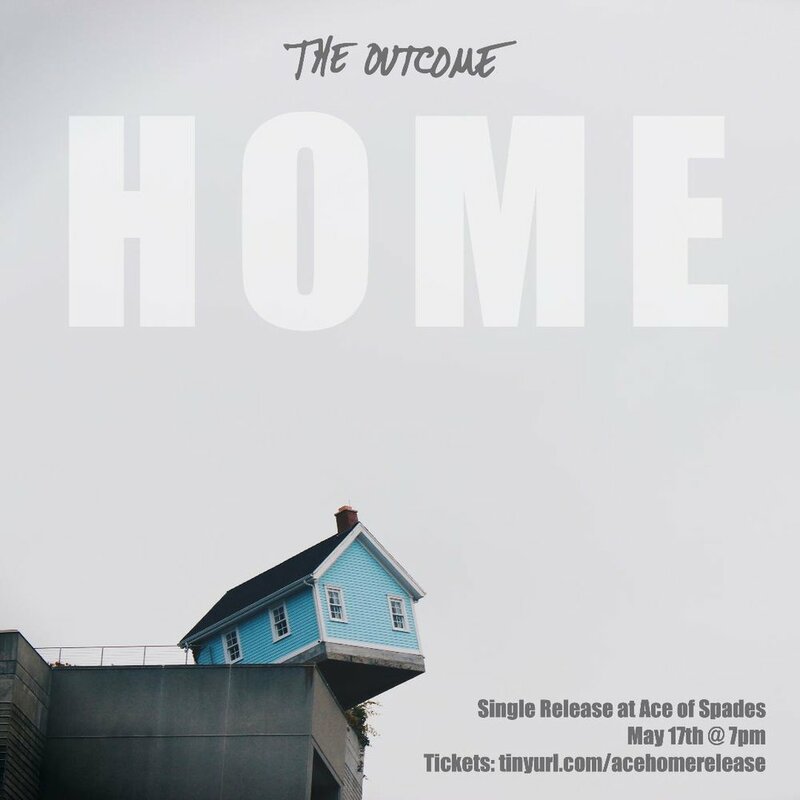 The Outcome (http://www.theoutcomeband.com) will be playing at the Dive Bar (Sacramento) on Tuesday, June 6th from 9:30PM - 12:00AM. We had a very productive 2 days of recording last month and can't wait to share with you what we've been doing! P.s. I recently received a promotion at work...yes, I'm officially now in management. Please send me any helpful advice, as I know I'll need it! P.p.s. "Slightly South of Stormy Clouds" was reviewed and featured in issue #80 of The Big Takeover Magazine! It's pretty cool because it's a nationally published magazine! P.p.p.s. I'm looking forward to a couple of awesome excursions this month with Davita. We have tickets to check out "The Price is Right Live" and "Roger Waters"!! P.p.p.p.s. Liam is now standing on his own...Check out his first school picture! P.p.p.p.p.s. The Phillies are officially the worst team in baseball once again....ugh. Well, after three long years of working on "Slightly South of Stormy Clouds", it was finally released! Following appearances and interviews on Good Day Sacramento, Fox 40 News, Insight on Capital Public Radio, The Placer Harold, and the Sacramento Business Journal, I was able to completely SELL OUT the event one week in advance! I could not have been more proud of the event and all of the phenomenal support I received that night! Slightly South of Stormy Clouds is now officially available for purchase at my OFFICIAL BANDCAMP PAGE, iTunes, Spotify, Amazon, CD Baby, and many many more online stores! I will also have copies for sale at all of my performances. The movie that I produced for the Official Launch Event can be viewed HERE . Moving forward, I have a lot of really exciting shows coming up with The Outcome! We will be performing at The Dive Bar (Sacramento) on April 11th, at The Torch Club (Sacramento) on April 14th for Happy Hour, and we are also really excited to perform at Sacramento's First Festival on May 6th! If you would like to purchase tickets to the First Fest, we are offering reduced rate tickets with an Outcome T-shirt and a copy of our unreleased EP. If you are interested, please click HERE (http://www.theoutcomeband.com/firstfest/) . The Outcome will also be returning into the studio in May to work on some new material. These are exciting times, and I'll be sure to keep you posted! P.s. If you did purchase a copy of the album, I'd love to hear your thoughts of it! I love receiving emails. P.p.p.s. Baseball season is finally here!! I'm hoping for a 3rd place finish in the NL East for my Phillies. They have some exciting young players and I'm looking forward to seeing them develop. P.p.p.p.s. I recently saw a couple episodes of 'The Santa Clarita Diet'....WTF? P.p.p.p.p.s. I have officiallymastered the technique of breathing through my mouth while changing poopy diapers. Slightly South of Stormy Clouds to be Officially Released on March 23rd! I am not allowed to sell tickets at the venue, so tickets MUST be purchased prior to the event! Tickets are $20/ea. which includes a copy of the album. There's a ton of great stuff happening this month, including the official release of "Slightly South of Stormy Clouds"!! FINALLY!! * My song "Forever More (https://www.youtube.com/watch?v=Vd_DVHJM7bo) " was just named a semi-finalist in International Songwriting Competition! It made the top 10% of submissions worldwide. This is the second time a song of mine made this semi-finalist list (Without You - 2013). * I'll be performing at House of Oliver (http://www.houseofoliver.com) (Roseville, 7-11 PM) on Friday 3/3 and at UnWined (http://www.unwinedonsutter.com) (Folsom, 6:30-9:30 PM) on Saturday, 3/4. * I will be appearing on some Sacramento morning news (Good Day Sacramento & Fox Morning News) to promote the album release! High-Five! * The show "Summer House" is awful. * The Outcome was selected to play in Sacramento's "First Festival"! The guys and I are really sounding tight these days. Please stay tuned for some exciting upcoming news and events! * Baseball season can't come soon enough! Lets Go Phillies!! * For those of you who can't make it to the album release, I will let you know how to purchase the album next month. As always - thank you SO much for your continued support! P.S. If you'd like to know more about the release, the Press Release for the album launch is below! Local Sacramento music artist Quinn Hedges will unveil his latest album in spectacular fashion. He and several collaborators created a dozen captivating videos that will be featured in a movie that coincides with the release of the album. Hedges will showcase his new album – “Slightly South of Stormy Clouds” – on Thursday, March 23, 7 p.m. at Blue Oaks Center Theatre in Rocklin. The one-hour movie will include a video of all 12 songs on Hedges’ latest album. The movie videos will be compiled in order to play the songs uninterrupted along with the album, reflecting Hedges’ vision of how the album was intended to be heard. Hedges wrote all the songs on “Slightly South of Stormy Clouds,” a self-reflecting musical journey about life in transition. “Slightly South of Stormy Clouds” was a unique collaboration of highly-talented musicians and producers on both the West and East Coast. Hedges’ cousin – John B Hedges – is a gifted musician and arranger who co-produced the album. Hedges flew to Philadelphia in 2015 to record with his cousin, who assembled world-class talents at the famed Milkboy The Studio. The downtown studio has previously recorded a who’s who of artists, including Justin Timberlake, Celine Dion, ACDC, John Legend, Dave Matthews, Rhianna, Kanye West, and many more. The finishing touches to the final mixes were then applied by Bob Ludwig, a legendary mastering engineer for Gateway Mastering Studios in Portland, ME. He is a multi-Grammy award-winning engineer who has worked with diverse artists and bands like Led Zeppelin, The Who, Jimi Hendrix, Steely Dan, Alabama Shakes, Jeff Beck, and Radiohead. In 2012, Hedges was voted “Best of the City” in Sactown Magazine and The Quinn Hedges Band released the album – “Step Outside.” In 2013, a Hedges’ song – “Without You” – was a semi-finalist in the International Songwriting Competition. Tickets to the showing of “Slightly South of Stormy Clouds” cost $20 and includes a copy of the album. To purchase tickets, visit www.quinnhedges.brownpapertickets.com. Tickets must be purchased online. For more information on Quinn Hedges, visit his website at www.quinnhedges.com or email him at info@quinnhedges.com.